Disclaimer: There are spoilers in this article. The Black Panther first entered the Marvel Cinematic Universe back in 2016 in Captain America: Civil War. Now he’s got his own film, which goes way beyond the usual expectations of fantasy, fight scenes and romance. Having a plot based around a black superhero with a predominantly black cast is a first for Marvel, but the film builds on this concept in a massive way. Directed by Creed’s Ryan Coogler, it is set in the mythical country of Wakanda: a hidden African kingdom with incredible technological power, due to its reserves of the world’s most useful precious metal. 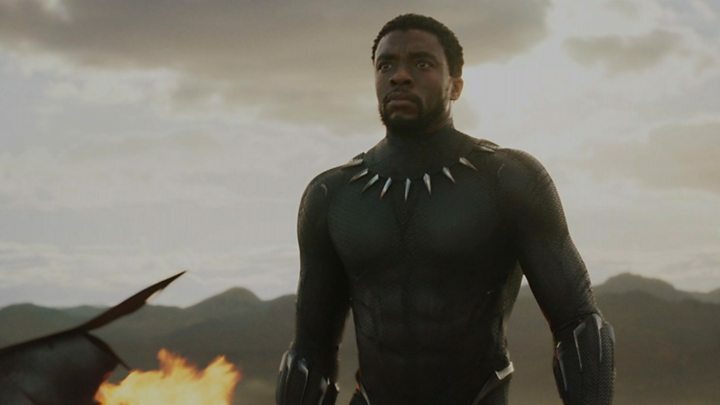 Chadwick Boseman, who plays its king T’Challa and (more importantly) the Black Panther, tells the BBC that getting Wakanda right was the most important thing. “This is fantasy and we have to create a culture,” he says. “It’s not necessarily because it’s the first time we’re seeing a black superhero; I think it’s because we have to define what Wakanda is. “It can’t be some generalised version of what the country is or the accent. “It can’t be generalised in why we wear certain clothing or why we have the number of tribes we have – what are those tribes? This is echoed by his co-star Lupita Nyong’o, who plays Nakia in the film – his love interest and moral compass rolled into one. The Oscar-winning actress tells the BBC: “We’re in Africa and we meet an entirely new nation that the world has never been to, and it delivers on feeling like another part of the world. Boseman says both he and Coogler were concerned with how the Black Panther character would deal with conflict in the film, as his life is essentially well protected. “He has superpowers, he has a suit that’s bulletproof and some nearly unstoppable soldiers around him,” says the 41-year-old actor. This the essence of the film – it tussles with the dilemmas of a man who is ignorant to the suffering the rest of the world faces. It comes to a head with the introduction of the villain, Erik Killmonger, played by Michael B Jordan. Half American, half Wakandan, Erik comes to the kingdom on a mission to help oppressed Africans suffering around the world after experiencing it first hand. “The arguments of all the characters in this film are so valid, so well thought-out, and that’s what creates such a unique tension,” says Nyong’o, star of 12 Years a Slave. Nyong’o hopes that the film not only “brings people together to experience something mythological and folkloric” but also allows them to “reflect on some really deep and important issues”. Her co-star Danai Gurira – who plays Wakanda’s military leader Okoye – says the film also addresses the importance of having well-rounded female characters, as opposed to just “strong” women. It comes at a time when inspirational female superhero films are thin on the ground. Marvel’s rival, DC Comics, may have brought out Wonder Woman last year, but the former’s female-led Captain Marvel film is not due for release until 2019. There was also criticism of Marvel’s Iron Man 3 in 2013, after it scrapped the idea of having actress Rebecca Hall play a villain. Instead it brought in a male villain, played by Guy Pearce, and reduced Hall’s role to one of much less significance. Gurira says “strong is definitely great, but it’s a component – we want a fuller picture. Gurira, best known for playing Michonne in The Walking Dead, says that when she writes plays, she wants to write characters “where the actor gets a full work-out when they step into a role”. “It is about being fully human and being allowed to be a stakeholder in a narrative. It’s about being allowed to be complex, to have dimension and to play a character,” says the author of Eclipsed (2009). Nyong’o says part of Black Panther’s significance comes from the way it shows how developing the harmonious world of Wakanda allows its “citizens to realise their fullest potential”. “You see women alongside men sitting in their power and making a different to the future of their nation in a very exemplary manner,” she continues. Black Panther is out in the UK on 13 February.